Dinah Maria Mulock was a talented author and poet. 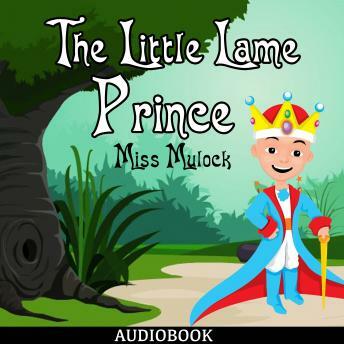 Among several of her children's classics are "The Adventures of a Brownie", followed by the world famous tale,"The Little Lame Prince". Yes, he was the most beautiful Prince that ever was born. Of course, being a prince, people said that; but it was true besides. The Prince's christening was to be a grand affair. By six in the morning all the royal household had dressed itself in its very best; and then the little Prince was dressed in his best -his magnificent christening- robe; which proceeding his Royal Highness did not like at all, but kicked and screamed like any common baby. In truth, though very few knew the Prince in coming to the chapel had met with a slight disaster. His nurse - not his ordinary one, but the state nurse-maid - an elegant and fashionable young lady of rank, whose duty it was to carry him to and from the chapel, had been so occupied in arranging her train with one hand, while she held the baby with the other, that she stumbled and let him fall, just at the foot of the marble staircase. To be sure, she contrived to pick him up again the next minute; and the accident was so slight it seemed hardly worth speaking of. Consequently nobody did speak of it. The baby had turned deadly pale, but did not cry, so no person a step or two behind could discover anything wrong; afterward, even if he had moaned, the silver trumpets were loud enough to drown his voice. It would have been a pity to let anything trouble such a day of felicity.